Does your Procurement Team have tommorow’s Procurement Skills? Almost half of the respondents, participating in the Deloitte Global CPO Survey 2013, indicated that their teams did not have all the skills required to deliver against the evolving requirements of the business. 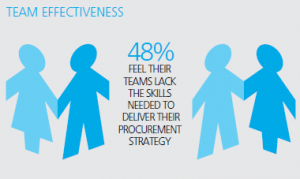 According to the survey,the Procurement organisation of today (and the future) requires a significantly broader set of skills than just the core professional skills of the function. Just like all other enabling functions such as IT, Finance and HR, it is now time for Procurement to more fully recognise the increasing number of specialist roles required to deliver the full value of a Procurement function. Specialised roles with distinct responsibilities, organised across a broader business agenda. The skills required to fulfil these roles are not the Procurement skills of today, but if done correctly they will become the Procurement skills of tomorrow. The Deloitte CPO Global Survey report presents the findings from our 2013 survey, comprising of over 180 responses across 18 countries. The participants have a combined turnover of US$2.7 trillion across Europe, Middle East, Africa, Asia and Australia, and cover all major industry groups. Click the link to download a copy of the full report.